Packed full of innovative, energy efficient and time saving features. 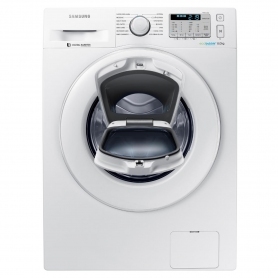 With the AddWash WW80K5413WW, Samsung have thought of just about everything you could need in a washing machine. Looking for a different colour to match your kitchen? This model is also available in graphite. 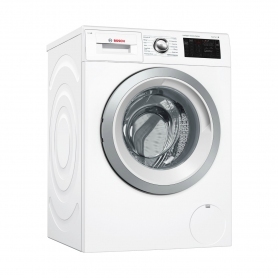 Or if you’re after something a bit smaller, there is also a 7 kg model in white available too. Realise the power of bubbles with innovative ecobubble technology. A component under the drum, called the bubble generator, is used to create a soapy foam which is then pumped in with your washing. Not only does this dissolve and activate the washing detergent faster, it also penetrates fabric deeper and more evenly than standard washing machines. The Bubble Soak function takes advantage of ecobubble technology to get rid of stubborn stains. 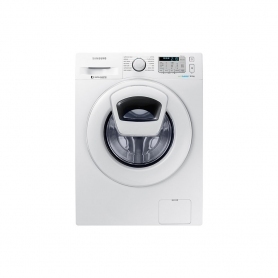 This function can be added to any programme at a touch of a button and ensures your clothes are soaked in bubbles for an extended period to allow for even deeper fabric penetration. In addition to amazing cleaning results, ecobubble technology allows you to use lower temperatures without compromising on performance. The deeper and faster penetration of bubbles means the cleanliness of your laundry isn’t dependent on the heat of the water. Washing at lower temperatures means less energy is needed – saving you money and protecting the environment one wash at a time. 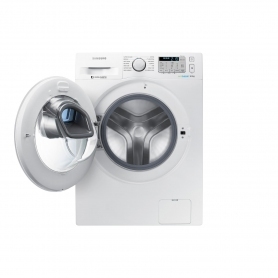 The Samsung WW80K5413WW has 14 programmes, each with deliberate changes to aspects of the wash, to ensure your laundry gets a thorough clean. Whether you need to wash your waterproof coat after a weekend spent in the wild or your little black dress after a wild night out, there’s a programme to suit your needs. Give Mother Nature a helping hand and save yourself some money with the Super Eco and eCotton programmes. These cycles take advantage of ecobubble technology to use temperatures as low as 15℃ whilst still achieving perfect cleaning results. The Quick Wash setting can clean up to 2 kg of laundry in just 15 minutes – perfect if you’ve just woken up on Monday morning and realised you haven’t washed your work clothes or uniform. You’ve just put your laundry in the washing machine and started the cycle. On your way back through the house you notice you’ve left a trail of stray pants and socks along the way – which is about as helpful as crumbs were for Hansel and Gretel. This is where the ingenuity of Samsung AddWash comes into play. An extra door built into the main door of the WW80K5413WW allows you to add to the wash while there’s a programme running. Simply pause the cycle, open the AddWash door and put in your stray items. The door is even large enough for bulky items such as towels. There’s no need to wait for the water to be drained or for the main door to unlock. 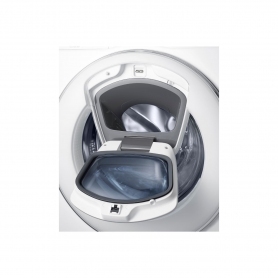 AddWash allows you to add items of clothing to the wash at any point during the cycle. This is ideal for items that only need a rinse or spin. Instead of running a separate rinse cycle for a single, simply wait for your current cycle to reach the rinse stage and pop it in the machine. Quiet, reliable and long-lasting performance comes as standard thanks to the Digital Inverter Motor. Using strong magnets rather than the standard brushes means there is less noise, less vibration and less wear and tear. An amazing 10 year warranty allows you to be as confident as Samsung that the motor will carry on performing time after time. In the rare event that there’s an error with your machine, you’ll be able to easily diagnose the problem without leafing through the manual or calling out an engineer with Smart Check. Simply download the Smart Check app on your smartphone and scan the error message that’s displayed on the LED screen. 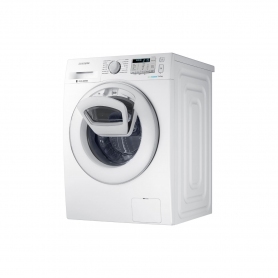 The WW80K5413WW is a premium washing machine that delivers outstanding results across the board. With ‘A’ ratings in both wash and spin efficiency and A+++ in energy efficiency, you’re guaranteed to get an exceptional clean with every wash – order yours now.